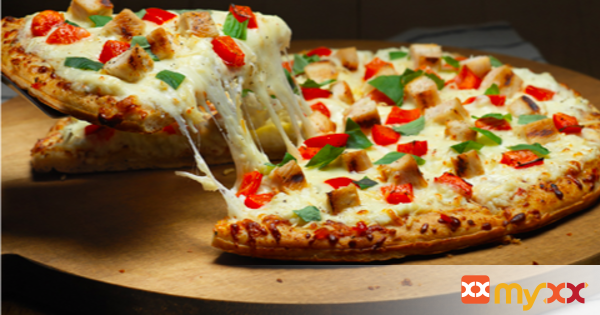 White Pizza with grilled chicken and bell peppers. 1. Heat grill for indirect grilling: Light one side of grill, leaving other side unlit. Close lid; heat grill to 400ºF. 2. Mix dressing and garlic. Drizzle 3 Tbsp. over chicken in shallow dish; turn to evenly coat both sides of breasts. Refrigerate 5 min. 3. Place chicken over lit area of grill; cook 6 to 8 min. on each side or until done (165ºF). Cool slightly; cut into bite-size pieces. Brush pizza crust with remaining dressing mixture; top with all remaining ingredients except basil. 4. Place pizza on grill over unlit area; cover. Grill 12 to 15 min. or until cheese is melted and crust is golden brown, monitoring for consistent grill temperature. Sprinkle with basil.